Pakistan is conducting nuclear missile tests and reportedly plans to increase its nuclear weapons arsenal. While it develops these armaments flood relief efforts for its own people remain low on funding. The UN World Food Programme (WFP) is urgently seeking 15 million dollars as it tries to feed flood victims. It’s part of a larger relief operation to help the hungry in Pakistan who are suffering from conflict, natural disasters and poverty. WFP Pakistan Country director Jean-Luc Siblot says, “We could scale up our response to reach up to 250,000 families – that’s 1.7 million people. But that would mean using food stocks earmarked for relief to the displaced population in the northwest of the country and these would have to be replenished by December – that means funding is needed now.” WFP depends on voluntary donations from governments and the public. WFP reported earlier in the month that it had to cut its school feeding program in parts of Pakistan because of low funding. It also reported that the funding shortage would cause its food supply to run out in January. 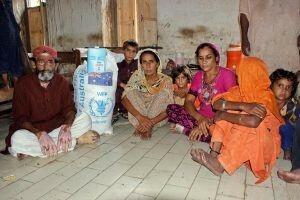 Pakistan made a contribution earlier this month to the WFP operation but clearly more can be done. Pakistan’s spending on the arms race in South Asia could be used to help the poor and suffering within its own borders. Pakistan, as well as India and other states, have a responsibility to limit the proliferation of nuclear weapons and to fight hunger and poverty. India and Pakistan need more treaties and less arms testing. Neither country is a member of the Nuclear Non-Proliferation Treaty or the Comprehensive Nuclear Test Ban Treaty. Pakistan’s nuclear expenditures would easily pay for the cost of WFP’s 2013-2015 Protracted Relief and Recovery Operation, which is meant to feed some 7.3 million people in Pakistan at a cost of US $514 million dollars.